This energy-saving LED, contemporary satin chrome floor lamp is a perfect way to update a modern bedroom or living room. Add an energy-saving modern touch to your space with this chrome finish LED floor lamp. 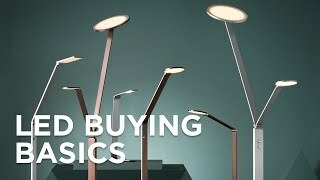 The slender metal body sits atop a round base while above, an adjustable arm raises and lowers with a sleek flat round shade containing the LED panel. Operates with an on/off touch switch on the base. A beautiful and functional home decor piece from Lite Source lighting. Energy-efficient sleek contemporary LED adjustable arm floor lamp. Arm adjusts up and down. Includes one 7 watt integrated LED panel. Light output is 480 lumens, comparable to a 50 watt incandescent bulb. Round shade is 5" wide and 1" high.